Top tin - Far exceeding the usual, Basilur Citrus Tea is an ultra-premium tea, perfectly blended with natural papaya, pineapple and rose and marigold petals to give it a robust and elegant flavour. 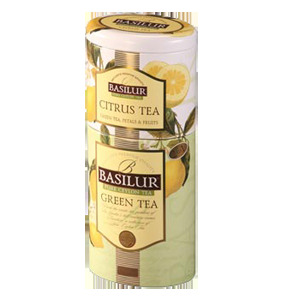 This is a connoisseur's perfect cuppa.nBottom tin - Basilur Green Tea is a fragrant infusion with an exquisite taste that lingers on your palate. This fine quality tea leaf is flawlessly crafted to bring out the full flavour along with its exotic fragrance and a smooth elegant taste of pure Ceylon tea.